Google's new "Search Plus Your World" feature is supposed to integrate social network data into search results, but at the moment it only pulls data from Google+ and Picasa. However, a group of anonymous Facebook, Twitter, and MySpace engineers--in partnership with several unnamed social networks, has released a tool to integrate other networks into "Search Plus Your World." In an ironic nod to Google's unofficial motto, the tool is called "Don't Be Evil." To install Don't Be Evil, visit FocusOnTheUser.org and click on the button that says "Try a More Relevant Google." Then, drag the "don't be evil" button into the browser bar of Chrome, Firefox, or Safari. The tool works best when searching for a general interest topic, such as music, cooking, or technology. With these types of searches, you'll often see a column of "People and Pages From Google+" along the right side of the screen. After clicking the "Don't Be Evil" button, however, these results become "People and Pages from the Social Web," with results that may include people from Twitter, Facebook, and other social networks. Clicking the button also modifies the Google logo to read "What Google Should Be." Don't Be Evil may also modify standard search results. For instance, a search for AT&T features the carrier's Twitter page near the top of results when using the tool, instead of its Google+ page. Finally, the tool can affect suggested search results in Google's drop down box when searching for a specific person. Don't Be Evil uses Google's own algorithms to decide which networks get top billing in the "People and Pages from the Social Web" column. 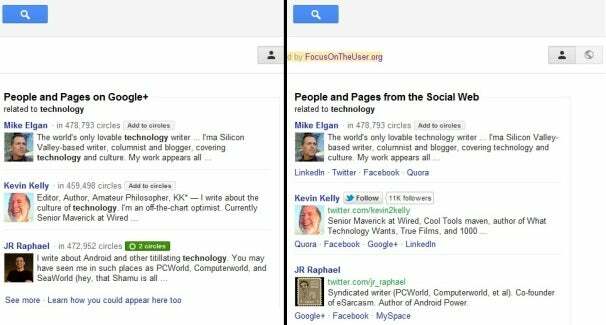 So for instance, if a person's Google+ page appears higher up than other networks in organic search results, Google+ will be featured under that person's name. But if the person's Twitter page has a higher Google ranking, Twitter will be featured instead. The tool also lists other networks that a person belongs to, such as LinkedIn or Quora, as long as they appear in the first 10 pages of organic search results for that person. "When Google focuses purely on delivering the most relevant answer to users, it does find the most relevant social result," the narrator of Don't Be Evil's explanation video says. Google has suggested that it's open to including other social networks in Search Plus Your World, but only if those other networks make a search deal with Google. Don't Be Evil attempts to demonstrate that no such deal is necessary, because even publicly available search data is enough to figure which network should get top billing for a given person. The tool doesn't use any APIs or special permissions to deliver results. The engineers behind Don't Be Evil are releasing the tool as open source code, and as they say in their explanation video, "we invite Google to use it." Not likely.